SAN FRANCISCO — The Women’s Building’s annual Celebration of Craftswomen, showcasing the work of more than 150 juried artists, takes place two Saturdays and Sundays, Nov. 24-25 and Dec. 1-2, from 10 a.m. to 5 p.m. at the Herbst Pavilion at Fort Mason Center, Marina Boulevard and Buchanan Street in San Francisco. 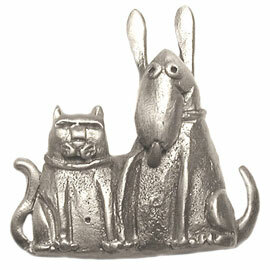 Pewter cat/dog pals magnet by Jami Miyamoto of Santa Monica. Now in its 34th year, the Celebration of Craftswomen — the only exclusively female show in the country — is the jewel of San Francisco’s alternative holiday shopping season. Featuring artists from near and far, this community-driven celebration offers the latest trends in handcrafts as well as the classics. Visitors can peruse and purchase a vast array of clothing, furniture and accessories, jewelry, bags and purses, bath and beauty items, housewares, ceramics and pottery, paper goods, glass, and art — all under one roof, and all made in the USA. Holiday shopping at the Celebration of Craftswomen not only provides a variety of unique gifts, but a new twist on engaging with your inner-crafts persona. This year’s show will include a large knitting lounge, engaging live art projects and entertainment. There will also be a gift-wrapping station, coat and baggage check, a café and food cart services celebrating the many food-craftswomen in the community. On Saturday, Dec. 1, a brand new program, A Celebration of Women and Film, will be launched, featuring Lunafest, a series of nine short films from women around the world; and the new acclaimed documentary by Bay Area filmmaker Kristy Guevara-Flannagan, “Wonder Women! The Untold Story of Superheroines,” a benefit for the Women’s Building that includes a pre-screening reception, a post-screening discussion with the filmmaker, and a silent auction. Thirty-four years of making craft fair history is no small feat. Held at the Old Wives’ Tales feminist bookstore on Valencia Street in San Francisco, and organized by Carol Seajay, and Paula Wallace, the first event featured 22 craftswomen from the Bay Area and a couple of food vendors. The crafts show was a huge success. Even so, no one dreamed it would become the largest and most respected women’s crafts fair in the nation. In 1980, the small founding group aligned with the Women’s Building and moved its show into the newly purchased building. Since its inception, the show has raised more than $1.7 million for the Women’s Building while providing a unique opportunity for women of the arts, regardless of color or background, to operate their own business within a supportive and engaged community for women, by women. The Women’s Building is a multicultural community center where women and girls can achieve self-sufficiency and pursue their dreams. Its programs include a free bilingual Spanish/English information and referral service, educational support for low-income adults, financial counseling, and community events that promote arts, culture, and discussion. In addition, building (located on 18th Street in San Francisco’s Mission district) houses 10 diverse community groups and has helped launch more than 160 women’s programs and initiatives. 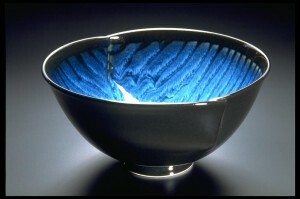 Bowl by Itsuko Zenitani of Oakland. Why not use the bus? San Francisco is a transit-friendly city. There are a number of lines that can get you to the celebration. Here’s an easy trip planner: www.511.org. If you’re planning on buying something big, like furniture, Fort Mason Center has paid parking available. Rates and more info are here: www.fortmason.org. The Celebration of Craftswomen loves the world of social media. You can keep track of the latest news, glimpse artist profiles and more when you “like” the event on Facebook (http://on.fb.me/M9NxEJ). Follow our missives on Twitter (@CraftsWomenSF). Check out the newly designed website (www.celebrationofcraftswomen.org) and use Pinterest (http://pinterest.com/craftswomensf) to show your favorite objects to your friends or better yet, create your pre-event shopping list. Admission is $9 for adults, $7 for seniors, students and disabled, and free for children ages 12 and under. A two-day pass is $12 and can be purchased online. The event is wheelchair-accessible. For more information, call (650) 615-6838, email [email protected] or visit www.celebrationofcraftswomen.org. 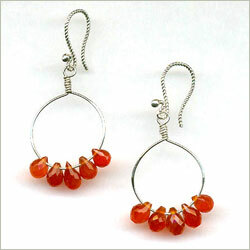 Trapeze earrings by Serena Kojimoto of Los Angeles.